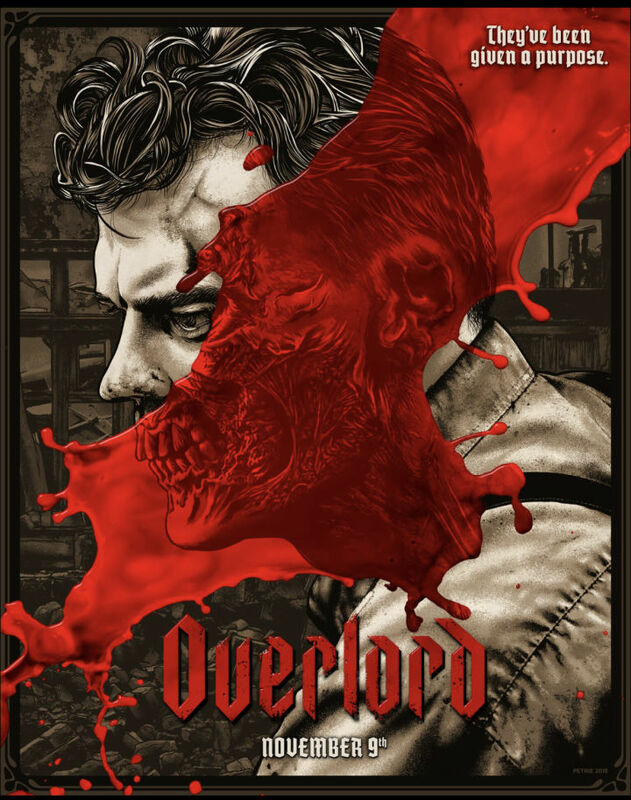 Overlord is Saving Private Ryan meets a Resident Evil video game meets Captain America: The First Avenger. And I mean that in very specific and detailed ways. The WWII movie is about a unit of the 101st Airborne being parachuted into Normandy the night of the D-Day invasion (the invasion being Operation Overlord, hence the title of the movie). Their mission is to take down one radio tower, built on the ruins of a church, that being destroyed will allow air cover for the beach landings, scheduled to start in just a few hours. The platoon suffers casualties during the landing, and only five of them survive to carry out the mission. This part of the movie is, of course, Saving Private Ryan, in ways both big and small. In both movies the unit’s sniper says that if you got him to Berlin, he could shoot Hitler in the head and the war would be over. It’s very nearly the exact same quote, though Saving Private Ryan’s dialogue was written much better. I’m not sure when “faithful homage” becomes “photocopying the script”, but Overlord seems to be well past that line. Here’s some more: The captain’s landing craft got shot up on Omaha Beach, many men dying; the airplane gets shot up over Normandy, many men dying. The men desperately exit the landing craft and make their way up the beach, the men desperately exit the aircraft and fall into Normandy. Many men die once they’re on the beach, many men die once they’ve parachuted, and their bodies hang from trees like the condemned at a gallows. The entire point of this part of the movie is to photocopy a scene from Private Ryan, and then to give it some kind of horror twist (either Zombie Movie horror or Horror of War horror). In Private Ryan, the squad walks along the countryside, weapons held at the ready, the men getting to know each other, and Oppum talks about his book. In Overlord the squad walks along a road—At night! Totally different!—with their weapons held at the ready, getting to know each other, and one of the guys is writing a book. He talks about the book, and is blown up by a mine. … just like a person infected by the T-Virus in a Resident Evil game. Which moves us to the Resident Evil portion of the movie. They trap villagers in bags and keep them marinated in goop, to produce more of the stuff, they have a decapitated head that’s kept alive, moaning to be released from its hellish existence, and monster soldiers are kept in cells, where unspeakable experiments are carried out. (Also, they infect villagers with the plague, then haul them out into the woods to KILL THEM WITH FIRE. The flamethrowers are cool, at least.) All of this in an ancient stone structure, filled with Weird Science Nazi gizmos, a nightmarish lab / morgue, helpless innocents killed by the monsters and the Nazis, and control systems for the radio tower. It’s Resident Evil. Or, at least, it wouldn’t be out of place in any of the Resident Evil games I’ve played. No giant monsters, but that’s about it. So the French resistance hottie (because there’s ALWAYS a hot French chick in a black leather coat with an SMG) is allowing herself to be used by the SS captain, in order to keep her brother safe, but the American soldiers are having none of that and in the ensuing firefight SS guy is shot in the face and races back to his Secret Base of Evils and Also Gory Horror. The soldiers chase him, set up an ambush, and begin killing Nazis. In the basement of the base, the Nazi captain injects himself with the zombie-making goop and becomes a super-strong super-soldier who looks a lot like the Red Skull, at least along the left side of his face. A gooey, bloody drippy, massive-scar-and-portions-of-his-cheek-hanging-loose Red Skull, but the Red Skull nonetheless. So the soldiers come for the tower, and run into its horrors. Down to just two survivors inside the base, one of them—the blonde dude (okay, sandy blonde. Same diff. )—is all shot up and dying so he injects himself with the goop, and becomes a super-strong super-soldier who takes on the Red Skull in a superhero battle. No, really. It’s right there in the movie. The two fight, things blow up, the tower is down, planes fly over the beaches, and Hitler’s 1000 Year Reich is on its way to being destroyed. YAY! Something happens when artists copy other artists who are copying other artists who made something great because they did the research, and everybody else after them didn’t. Your stuff feels bland, regurgitated, recycled, rote. It feels like a copy of a copy of a copy. There’s none of the unexpected but authentic details that a work needs to stay fresh. The WWII scenes of Overlord are copies of copies of copies. Not just photocopying exact scenes from Saving Private Ryan (to a shameless degree), but also scenes from Kelly’s Heroes (the minefield), The Longest Day (the clickers and challenge calls), and probably other WWII films I failed to remember or recognize. The WWII stuff is entirely as expected, no surprises, nothing different, nothing but barely-disguised versions of things we’ve seen before, dozens of times. It’s all safe. The same. No bold choices or risks taken at all, anywhere. It’s kind of lifeless. The Zombie Horror part of the movie is at least a fresh take on that. There are creatures, but only a couple of them get out, and there’s no Zombie Apocalypse scenes where zombies flood into the lab and eat the Nazis, who themselves rise as zombies. Shooting them in the head does nothing, instead KILL IT WITH FIRE is the trick, and there’s flamethrowers handy. It’s a different take on zombie lore, different enough to be fresh. The movie obviously had a lot of money behind it, and suffers from that—things look too neat and controlled and professionally done. This kind of horror often benefits from the rawness and flawed cinematography a low budget brings. It adds character, whereas a carefully controlled, fully storyboarded and scripted movie is utterly without character, like a beautiful but bland model. She’s hot, but there’s nothing distinctive about her, nothing that sets her beauty apart from hundreds or thousands more just like her. Horror movies need character more than prettiness, and this film is too pretty. All these issues aside, the movie isn’t bad as a zombie movie. It’s got chills and gore, evil bad guys and noble good guys. There’s bad things afoot, the soldiers stop it, and monsters get killed. It’s fast paced and delivers the goods. At heart, it’s a low budget zombie horror movie, made on a big budget. Still, it’s strange that a movie about the living dead should feel so lifeless. Makes me think of the movie ‘Dog Soldiers’. We live an amazing world where Hollywood retcons history itself…. Did you know that African Americans helped win WW2 by fighting on the front-lines. It’s true. Watch this film. Did you know that London circa 1946 was 30% black people? Go watch the film Christoper Robin to verify.